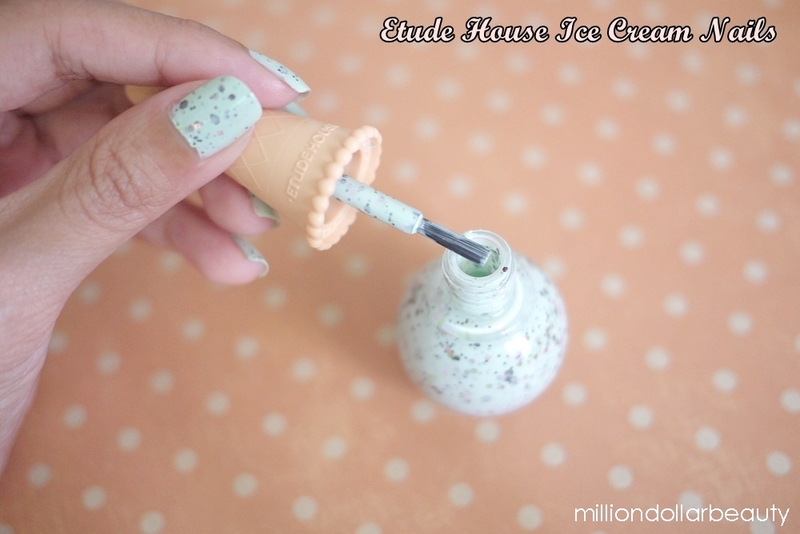 As promised, today I'm going to show you guys the new nail polish from Etude House Sweet Recipe Collection. I really love this color and it reminds me of mint ice cream with chocolate chip. This is one of the four colors that released by Etude House for their Sweet Recipe collection. 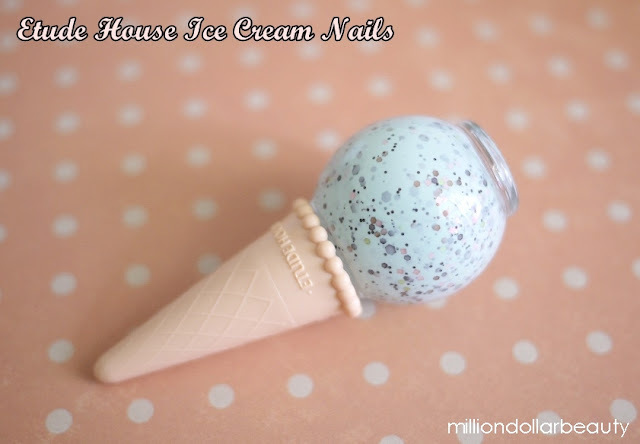 All the nail polish in this line is referred to as the Ice Cream Nails. I'm not too sure if each color has its individual name. It is a cream based nail polish with various glitters. It has copper, bronze and lime green hex glitters, pink square glitters and plenty of micro hex glitters in bronze. 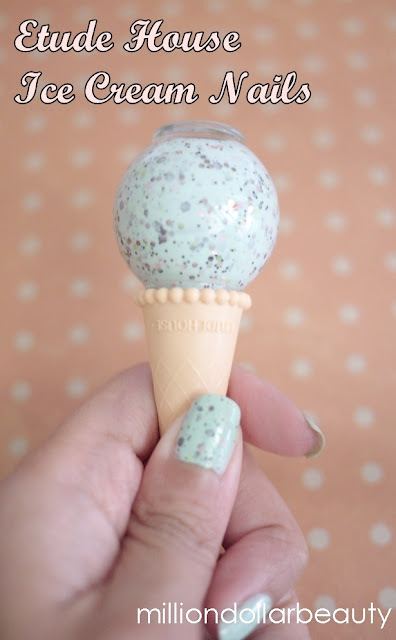 The combination of glitters are fantastic, however, the creamy mint base sunk the glitters. It would be much better if it is jelly base, that would definitely bring out the glitters more. It is quite streaky on first two coats. For me, it is pretty much ok because you really can't see the streakiness (if there's such a word) on naked eye. It is pretty sheer for a single coat, and full opacity can achieve with 3 coats. Overall, it is not too bad. Kudos for the packaging. The cone ice cream bottle is so freaking cute!!!! It really does resembles chocolate chip mint ice cream. It is pretty easy to use. The brush is easy to handle and drying time is fast. I have no problem with the application. Overall, I really love this nail polish. I think it would be much better if it is in jelly base but I don't exactly mind the cream base. I think you guys already know how much I love the packaging. I would buy it anyway, just to decorate my dresser with it. If you are going to ask me whether you should get it? My advice is YES, GET IT!!!! Pretty nail polish like this deserves your love. Besides, this is Etude House Spring 2013 collection. It won't be available forever. Best is, get it as soon before they run out of stock. By the way, I went to Etude House (Gurney Plaza) last Saturday. The sales girl told me that the Sweet Recipe collection is yet to arrive at all the Etude House stores. If you really want to check out the collection, you might want to wait until mid of this week? I don't want you to be disappointed like I was. ***I received the nail polish from Etude House media launch. Opinions are my own. No... Its chocolate chip mint! @Chuen: I had ice cream after posting this. I got swayed by it. @Deeyah KWP: Thank you. Visiting your blog soon. @Yuh Jiun: Exactly! I always get attracted by packaging like this. I like it.. the polish is something new.. the bottle is so cute and irresistable. cant wait to get it for myself.. do u mind sharing how much is it cost each? @edazz: Oopsie daisy.. I forgot to write down the price. It's RM25.90 each.